Every colours of Indian Flag describes some meaning. The saffron colour denotes the strength and courage. The white in the centre is light, the path of truth to guide our conduct. The green shows our relation to soil, our relation to the plant life here on which all other life depends. The Ashoka Wheel in the center of the white is the wheel of the law of dharma. The national anthem of India first written in Bengali language by Rabindranath Tagore, later it was adopted in Hindi version by the Constituent Assembly as the national anthem of India on 24 January 1950. The song jana- gana-mana was beautifully written by the legend Rabindranath Tagore. The song “Vande Mataram” is the national song of India. The song describes India as a Goddess. The song was the inspiration to the public of India who were struggling for freedom. The song “Vande Mataram” was composed by Shri Bankim Chandra Chattyopadhya, a great poet, novelist, journalist and essayist. The song firstly composed in Sanskrit. Later had other translation also. The song influenced the public so much that the public started shouting on the roads “Vande Mataram” and lead Indian public demanding for freedom.It was first published in the Bengali novel “Anand Math” in the year 1882. The song had equal status as National Anthem. It was sung firstly in 1896 session of the Indian National Congress. The song itself represents Nation passion. 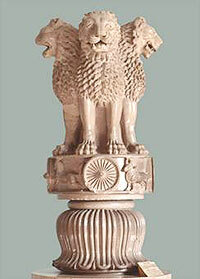 The national emblem of India is a replica of the Lion at Sarnath, near Varanasi. The national symbol represent modern India`s declaration of its ancient commitment to world peace and goodwill. On January 26, 1950 the emblem was adopted by the Indian Government. It has four lions, resting on a circular abacus. The fourth lion is hidden. The emblem symbolizes courage, power. The abacus is enclosed with lion to guide the north direction, the elephant to guide the east direction, the horse of the south direction and bull to guide the west direction. Carved out of a single block of polished sandstone, the capital is crowned by the Dharma Chakra. The abacus is situated in lotus explains the inspiration for creativity and source of life. The words “Satyameva Jayate” which means “Truth Alone Triumphs”, inscribe below the abacus in Devanagari script. The river Ganga is the national river of India. The Ganga is the most sacred and longest river of India due to which it has been selected as our national river. It comes from the Gangotri Glacier in the Himalayas as Bhagirathi river and combine with some other rivers like Yamuna, Sone, Alaknanda, Gomti, Ghagra and Kosi. The Indian people have strong faith in river Ganga and they perform many religious rituals near Ganga. The main religious are perform on the river banks at cities of Varanasi, Allahabad and Haridwar. The Ganga ends in Bay of Bengal. The national tree of India is Banyan tree which represents strong and longevity features. The tree is deep rooted and its branches describe the unity of the country. The roots spread across a large surface area. This huge tree provides shelter to the people in the hot sun. The size of the leaves of tree is large. Many people worship Banyan tree. In India, there is a tradition of worshiping trees and they have strong faith. In Hindu culture, Banyan tree is often called 'kalpavriksha' which means 'a divine tree that fulfills wishes'. Lotus is the national flower of India. Its botanical name is “Nelumbo Nucifera”. The Lotus represents divinity, fertility, knowledge, wealth and enlightenment. Lotus is an aquatic plant and its green leaves floats in water giving it a joyful look. The Lotus grows in murky waters and represents long life, honor, and good fortune. Most popular colors of Lotus are white and pink but sometimes blue lotus can also be seen. 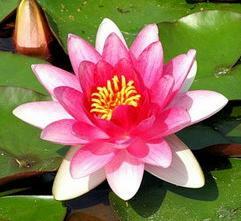 Lotus is also used by Hindus for practicing religious rituals. In religious point of view it symbolizes purity of heart and mind. 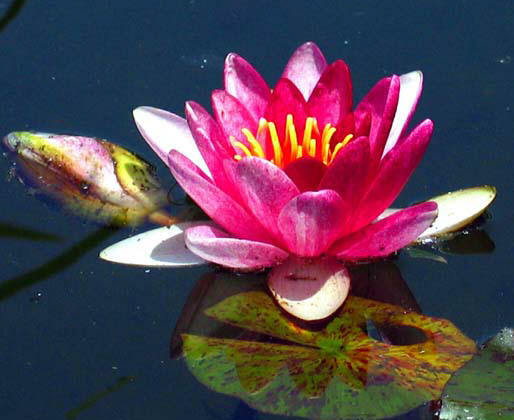 In ancient Vedic literature it has found that Lotus is declared as sacred flower. Goddesses Lakshmi and Saraswathi were also associated with Lotus flower. The fruit mango is the national fruit of India. This fruit is rich in Vitamins and good for health. In India there are over 100 types of mangoes found. Mangoes are very useful fruit, we can make a varied items with mango. The peacock is the national bird of India. The species is found in dry semi-desert grasslands, scrub and deciduous forests. It eats insects, fruits, seeds, berries, drupes small mammals and reptiles. The peacock represents beauty, pride and grace. The Indian male Peafowl is known as Peacock and female known as Peahen. 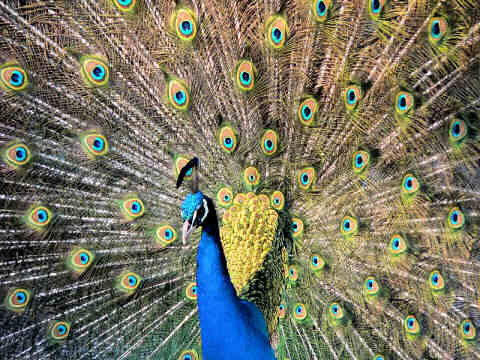 Peacock is the most noticeable bird. The peacock is characterized by an extraordinary crest and colored train. The feathers in the train are having spots like eyes. The train consisted of more than 60% of the total body. 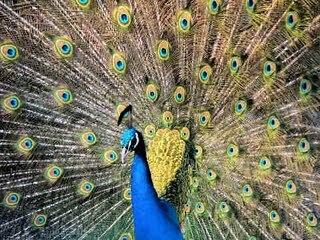 The truth about the beauty of peacock is world renowned but their voice is extremely harsh. The male of this species is more beautiful. They expand their feathers in the months of monsoon and dance which added more to its beauty. The sight of dancing of peacock is very gorgeous. Peacock had a major role in mythology. It was considered that God Kartik, rides on its back and also feather of peacock lies in the Lord Krishana`s Crown. Peacocks are protected under the Indian wildlife protection act, 1972. The population of peacock is maximum in the arid zone of Rajasthan. 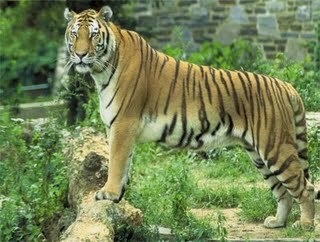 The National animal of India is called The Royal Bengal Tiger. India`s wealth in the field of wildlife is represent by Tiger. The main features of Tiger are incredible power, immense strength, keen predator, grace, intelligence made Tiger called as the lord of jungles and also selected as National Animal. Hockey is the national game of India. In 1927, the Indian Hockey Federation gained global affiliation and joined with International Hockey Federation. Hockey is the game in which India had such a great record. Due to Hockey India got its position in the field of sports and won 8 Olympic gold medals. The best period in Hockey in India was the period from 1928 - 1956 when India won 6 consecutive gold medals in the Olympics. The best player was Major Dhyanchand who made several records in Hockey. Primera foto de su majestad el Taj Mahal, arquitectura viva y palpitante. El mausoleo palpitaba como un dios, con una vida propia difícil de explicar. La impresión, en medio de la bruma matutina y la luz que lo hacía ver casi rosado, le daba un aire casi etéreo. Como si fuera una construcción del cielo manifestado aquí en la tierra. La impresión que causan sus minaretes exteriores, levemente inclinados hacia fuera para que en caso de algún terremoto pudieran caer hacia fuera sin dañar al monumento principal, es que acentúa la belleza del monumento. En el corazón de la historia de su construcción, está la historia del amor de Mumtaz y de Shah Jahan, que simplemente acentúa su misterio mayúsculo. Uno siente al caminar ante su presencia, que el sentido de la arquitectura se revela, se percibe elevación y armonía espiritual y un sentimiento de paz indescriptible. Es un dios para ser adorado en su exterior, desde el jardín, desde su plaza externa, para dejar que en su interior, en su eterno sepulcro, los amantes descansen. El sitio de su construcción es no menos intrigante. En las diapositivas pueden ver que la imagen del río que se encuentra a sus espaldas es igualmente fantástica. Por la calidad del cielo la mañana en que lo visité, el clima tan excelso que me tocó en febrero, y la humedad del aire –qué sé yo-, pensé que lo hubiera pintado Leonardo Da Vinci. ¿Qué hubiera pensado el gran Leonardo de haber nacido dos siglos después y conocer esta construcción? De cualquier modo, queda constatado con su existencia, que el Islam ha dado amantes legendarios y que no hay construcción en el mundo que pueda igualar el tributo a una amada, como lo es el Taj Mahal. ¡Cómo lamenté no pasearme por él tomado del brazo de mi amada! ¡Pues puedo comprender perfectamente eso que sintió el sultán que mandó hacer su construcción ante el dolor de haber perdido a su esposa! Un perpetuo anhelo por encontrarse con ella, fundirse en ella, en el templo celestial del amor a imagen y semejanza del lugar donde sus restos descansaron. Cito a Juan Claudio Carvajal que antes que yo también conoció esta maravilla para dar un punto de vista complementario a lo que menciono: “su marmoreo resplandor profana nuestro oscuro secreto, lo pulvoriza y nos vuelve, por un instante, lumínicos seres incapaces de vislumbrar la noche de nuestro misterio”. El Taj Mahal es también su jardín, elemento importantísimo de toda su arquitectura. Ese jardín, imagen del paraíso, con fuentes, árboles frutales, flores y muchas personas a su cuidado, crea el ensueño necesario para vislumbrar su aspiración. Prosternación es el sentimiento que causa, arrobamiento su contemplación. Por varios días, cerraba los ojos, y la imagen de su alabastro y proporción me perseguía antes de acostarme, como una divinidad celosa cuyo afán fuera instalarse entre mis ojos.